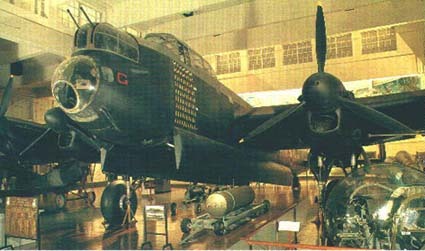 The veteran Lancaster "G" for George stands in the Aeroplane Hall at the Australian War Memorial. Several hundred thousand visitors view the aircraft each year. On return from a sortie, each crew would report details of the raid to an interrogation officer. The aircraft's performance, enemy contacts and descriptions of the target and reports of damage all formed part od the de-briefing. Then followed the release of tension as each man realised he had survived yet another mission. "Lancaster Crew" -- Stella Bowen. 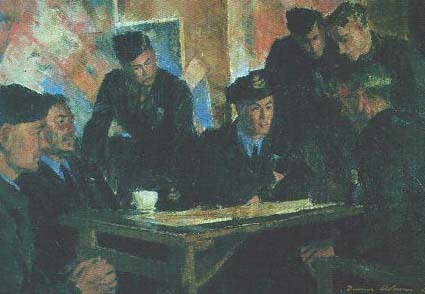 An Australian artist visited 460 Squadron's base at Binbrook in early 1944 to commence a painting of a typical bomber crew. 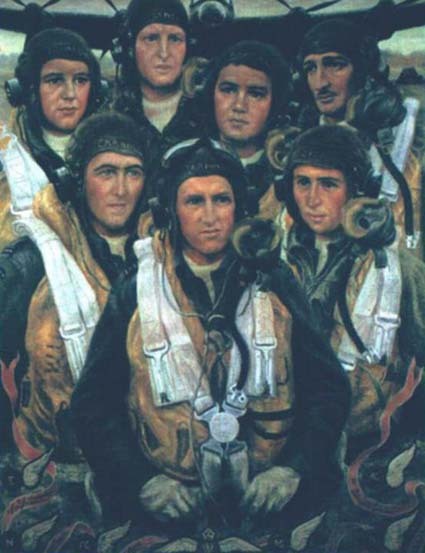 Before the painting was completed the crew had been lost in action -- shot down on a raid on Friedrichshafen on 28 April. Flying Officer T.J. Lynch survived to become a Prisoner of War. The rest of the crew were killed. So drastic were the losses in Bomber Command that 460 Squadron alone was to lose one thousand young men during the war.